How would you feel if you were approached by a stranger asking to cuddle your baby? Would your first instinct be to hand them over? Or would you feel a little taken aback with such a request? 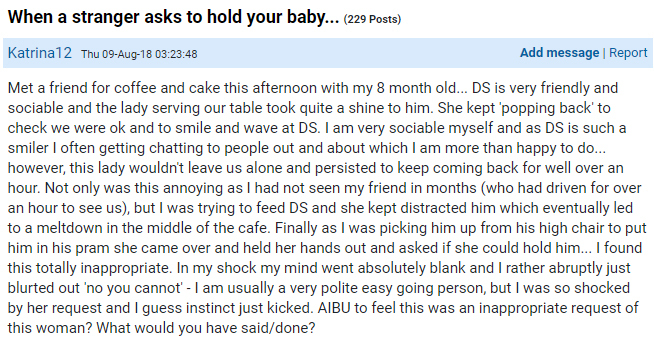 A mum has taken to popular parenting forum Mumsnet to ask if she was being unreasonable to be annoyed at a worker in a cafe who continually interacted with her eight-month-old son, eventually asking if she could hold him, resulting in the mum feeling rude when she was told no. There are plenty of reasons why a mum wouldn’t want some stranger touching or cuddling their baby. Someone else’s baby is not public property. The infant could be premature, and likely has a weak immune system due to not being old enough to complete a vaccination schedule, leaving them vulnerable to diseases. The baby may not enjoy being handled by strangers, leaving mum trying to calm and console an upset child for no reason other than someone felt entitled to a cuddle. Or the stranger could simply want to harm or kidnap the baby, it’s certainly not unheard of. Also, the most important reason why a mum might not want a stranger touching or cuddling her child — because it’s her baby and she doesn’t want them to! The thread was riddled with mums offering examples of their own experiences with well-meaning grannies touching their baby’s faces and asking for cuddles in the supermarket checkout. Plenty of these mums felt bad for not wanting these strangers to touch their child and let them go ahead and do it, while internally fuming and kicking themselves for giving in later. 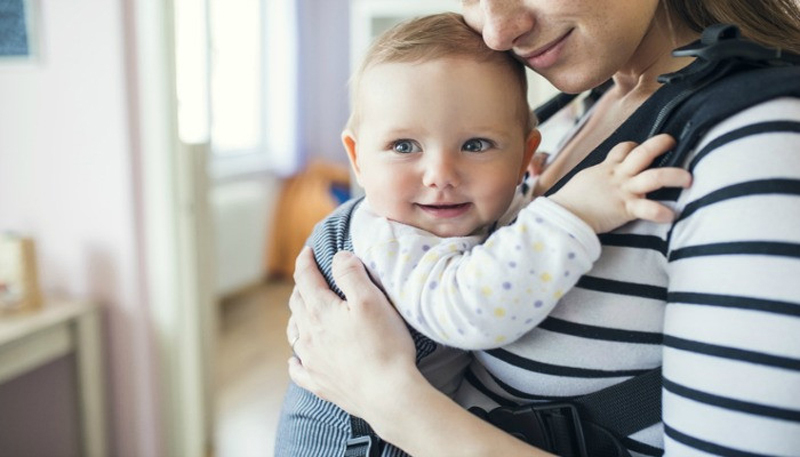 It is one thing to offer to help a mum when you think she might need a little assistance, but another entirely to assume that a new mum would be happy to offload her baby to a perfect stranger for a few minutes just so they could get their “baby fix”. So what do you think? Where do you stand on this? Would you allow a random stranger in a cafe to hold your child?